Our gourmet gifts can be grouped in a gift basket or may be packaged for stand-alone presentation. All are superlative. We have savory pestos & spreads, sweet or salty munchies, cookies, brownies & cakes, nuts, candies, smoked salmon and more. Combine them with a serving piece, platter or cutting board for added enjoyment. We travel around the country to taste and select only the finest delicacies for our clients to give as their gifts. Many of our products have won awards in their categories at international food shows. These tools are made of brushed stainless steel and feature handles with a droplet design that lie flat, making them the ideal companion to charcuterie or cheese plates. 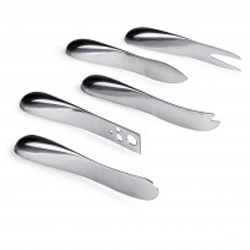 Set includes cheese fork, pointed-tip sharp cheese knife, flat headed cheese knife, fork-tipped cheese knife and soft cheese knife. Both chic and functional, this bamboo & ceramic entertainment set is the perfect way to display your edibles. The crisp, white dishwasher-safe ceramic bowls sit atop a handsome 100% bamboo tray--ideal for dips, candy and snacks alike. 11.25"x4"x2.2". In order to make the very best bourbon balls, one starts with a fine bourbon--Woodford Reserve. The bourbon-infused creamy centers are enrobed in rich, dark chocolate then topped with a pecan. These are THE BEST we've ever tasted! 1-lb. gift box. Award-winning handmade praline candy packed in a beautiful 12-oz. gift box. 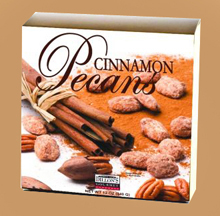 The freshest of pecans with an all-natural, buttery, praline candy coating. A great gift for any occasion or as an indulgence for yourself. 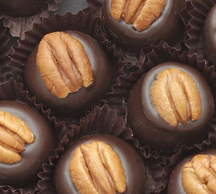 This handsome combination includes individually wrapped Pecan Caramel Clusters on the top. 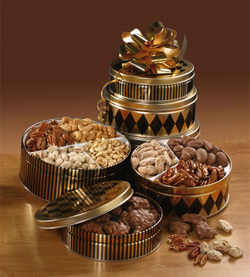 The middle tin has Cinnamon Glazed Pecans, Glazed Pecans and Chocolate Covered Pecans. And finally the bottom tin has an assortment of mouthwatering nuts including Roasted & Salted Pecans, Pistachios, Cashews and Peanuts. "My client in Los Angeles received the basket yesterday. He described it as first class, great presentation. Needless to say, it reflected on me very well." "I recently received a gift basket from my contractor. I was extremely pleased with the contents and have received rave reviews from my fellow employees who have tasted the products that were enclosed. We send gifts to our tenants a couple of times a year and this is the type of product we like to send on occasion." "Thank you for your good guidance on the baskets. We had many compliments on 'our' good taste (how about that!) Well...we did have the good taste to ask you for help."